A world of science opens up to students when they begin lab work. Getting their hands involved in the process engages their brains in different ways from a classroom lecture. 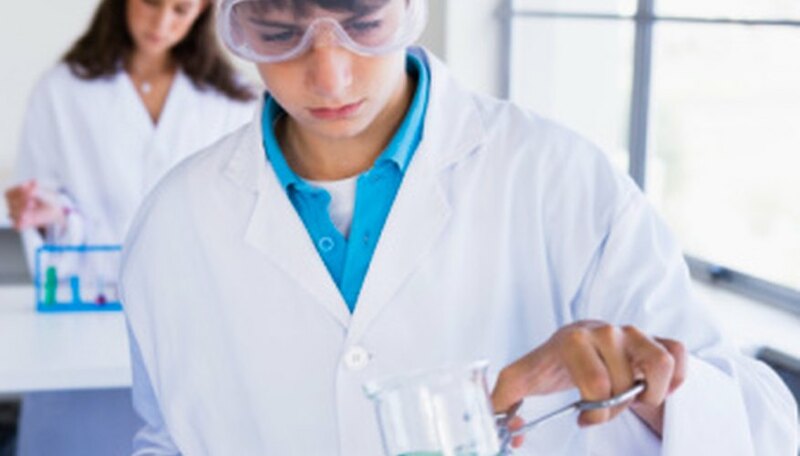 Especially at the junior high age, when it may be their first time in a science lab, students get satisfaction from completing a tangible project while learning at the same time. You can use extracted red cabbage juice as a natural pH indicator. At neutral pH (pH 7), the juice is blue-violet in color. When you add something acidic to the juice, such as vinegar, the cabbage juice turns red. When you add something alkaline, such as baking soda, the cabbage juice turns bluish-green. You can also create pH indicator paper by soaking filter paper or other porous paper in the cabbage juice, then allowing it to air dry. How does temperature affect a chemical reaction? Obtain two identical cups. Fill one with ice water, and fill the other with hot — but not boiling — water. Drop a seltzer tablet into each one simultaneously. Note how long it takes each tablet to dissolve. You can make a form of biodegradable plastic in the lab, or even in your own kitchen, starting with milk. Place 2 cups of milk in a heavy pot and heat almost to the boiling point, then add 4 teaspoons of vinegar. Stir as curds begin to form. Drain the mixture over a colander and let the curds cool, and mold the curds into your desired shape. Compare this plastic with any plastic around your school or house — is yours harder, more pliable, different in color? How Many Nutrients Are Lost When We Boil Vegetables? In this experiment, you will test water for the presence of vitamin C both before and after having cooked carrots in it. If a high concentration of vitamin C is present in the cooking water after the carrots have been cooked, you can assume that a lot of the nutrients have been lost in the cooking process. To test for the presence of vitamin C in the solution, you will use cornstarch and iodine. Combining cornstarch and iodine turns the water blue, but when you add vitamin C to this solution, the mixture becomes clear. To perform the experiment, take a sample of the water before you cook your carrots and add it to a mixture of water, cornstarch, and iodine; this should stay blue. Cook your carrots until they are soft. Then, take a sample of the cooking water, and add it to the same cornstarch-iodine solution. Does it stay blue, or does it turn clear? Yool, Brooke. "8th Grade Chemical Reaction Experiments." Sciencing, https://sciencing.com/8th-grade-chemical-reaction-experiments-8338249.html. 24 April 2017.